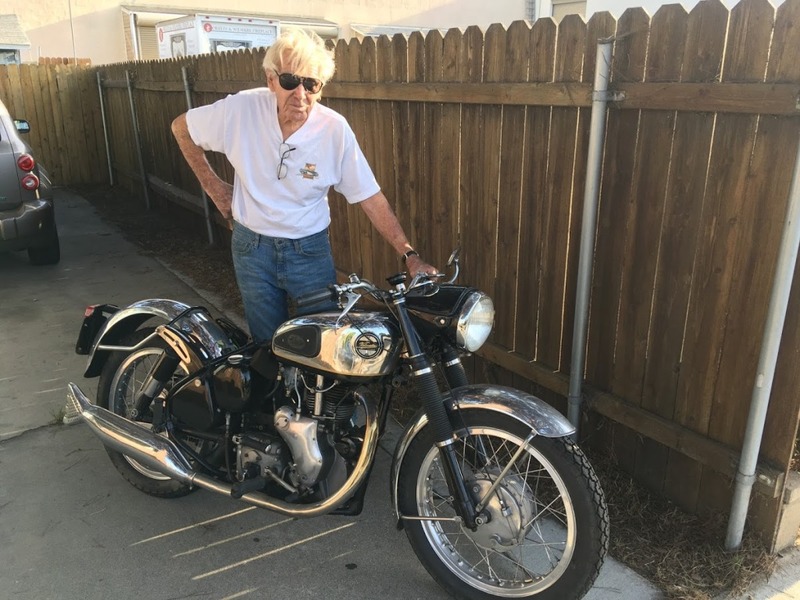 Like he did almost every weekend since he got a Matchless 500 motorcycle at age 14, Mick Felder went on a motorcycle ride this past Veterans Day Sunday. The Matchless was British and he favored British bikes for the rest of his life. On Veterans Day, he rode an early ‘60s BSA 650 that he had restored. Longtime riding friend Rick Craig was leading when the two of them approached a hairpin turn on Little Tujunga Canyon Road in the hills above Pacoima. When Craig came out of the curve he looked in his mirror for Felder and didn’t see him. “Mick must not have seen the curve coming and was going too fast to get through it. So he locked up his brakes and laid down his bike to slow up before he hit the guardrail,” Felder’s nephew Dave Smith speculated after learning about the accident. “He was a good motorcycle rider. He knew what he was doing. But he just made a mistake, like we all do,” Smith said. 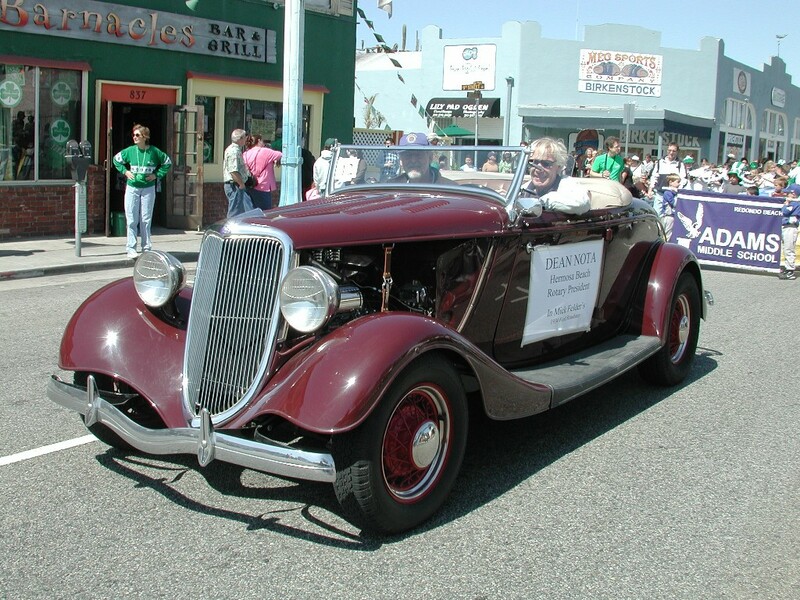 Mick Felder driving Rotary president Dean Nota in the 2006 St Patrick’s Parade. Felder’s car is a restored 1934 Ford Roadster. Though he broke a hip, a wrist, an arm and some ribs, Felder was expected to recover. When the biking world, and his Hermosa Rotary, Chamber and Salvation Army friends heard he was hospitalized, the reaction was a combination of admonishment and admiration. Felder was 83. When he died three days later of pneumonia the reaction was admiration with a touch of envy, especially among his contemporaries, who long ago gave up riding. 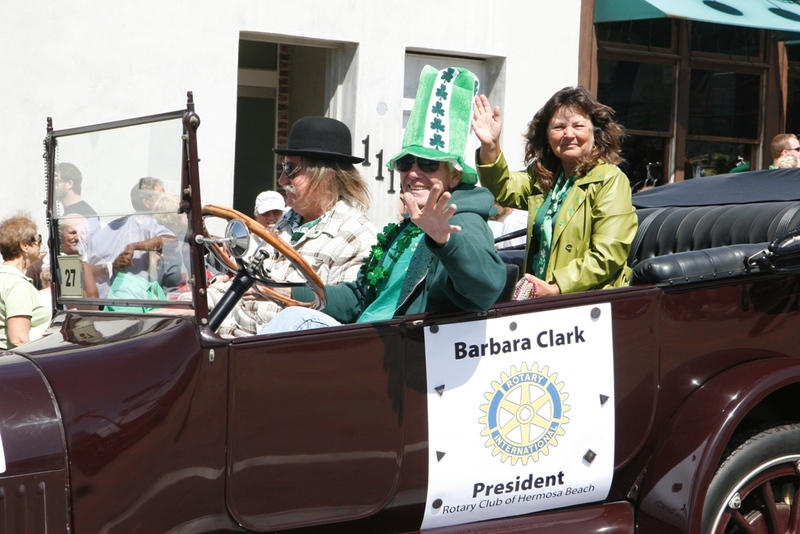 Mick Felder driving Rotary president Barbara Clark in the 2010 Hermosa Beach St. Patrick’s Parade. Every day since 1968 when he opened Felder’s Body shop at 210 Pacific Coast Highway, he walked to his shop from his home across the street and worked or rode one of his dozen vintage motorcycles. “Mick started repairing foreign cars and motorcycles because in the ‘60s it was hard to get parts for them. So that became his niche,” said Smith, who worked for his uncle from the time he was 13, in 1970, until 2001, when he opened his own repair shop in Buena Park. “Mick restored a lot of Porsche 356’s (the first production Porsche) and a lot of Velocette bikes before either of them were worth anything. The first car he restored was the 1929 Model A Roadster he got in high school. That car was a lifetime project. He didn’t finish working on it until just a few years ago,” Smith said. Felder’s showroom was filled with a rotating exhibit of classics that turned heads on Pacific Coast Highway. “Out of town folk would stop in because my cars were like ones they had when they were young,” Felder said in a video produced by the Hermosa Chamber. 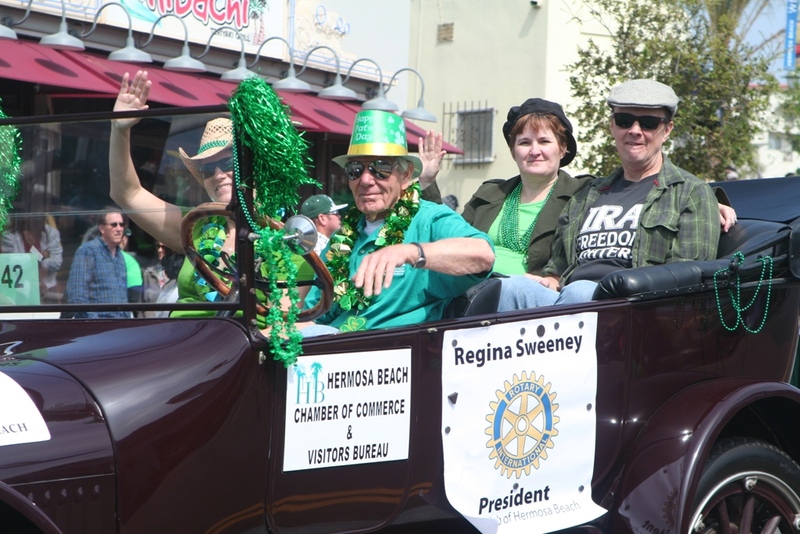 Always on display were the 1929 Roadster, a dorky, 1949 red Cushman scooter and a 1917, horseless carriage style Studebaker that he drove the Rotary president in each year in Hermosa’s popular Saint Patrick’s Day Parade. But on any given day a meticulously restored red TR3 might be moved out to make room for a rare, maroon MGA, blue Porsche 356 or another Velocette or BMW bike. “He had lady friends, but they didn’t worked out. His cars were his kids. If he thought you were worthy of one of his restorations, he’d seek you out. It was never about getting top dollar. It was about where the car was going, would it be taken care of,” Smith said. Alec Carlson, floor manager of the Automobile Driving Museum in El Segundo, recalled bringing his cherished, 1937 Ford Deluxe Tudor Sedan to Felder after his grandfather flattened backed the car into a wall, flattening the passenger side rear fender. “Mick pounded out the fender without removing it from the car. Then, rather than repaint the whole car, he matched the paint. I told him it looked perfect. He said, let’s look at it in the sun. After parking it outside I said, it’s perfect. He said it needs more white and repainted it,” Carlson said. In 1980, Hermosa City Treasurer John Workman introduced Felder to Rotary. Soon, he and Bob Peterson, who joined Rotary in 1950, began delivering Meals on Wheels for the Salvation Army. Meals on wheels was a Rotary project, meant to be rotated among its members. But in recent years, as the Rotary membership suffered attrition, Felder and Peterson did the deliveries themselves every Tuesday. Felder was twice named Hermosa Beach Man of the Year by the chamber and twice served as Rotary Club president. “Every holiday he’d help the Salvation Army raise money by ringing a bell in front of the Von’s market. He wouldn’t yell. He’d just ring the bell. He was very modest and didn’t like drawing attention to himself,” Smith said. Felder’s daily driver was a yellow Falcon pickup. He never drove his attention getting restorations, except in parades and to and from car shows. A memorial service for Mick Felder will be held Saturday, Dec. 8 from 8 a.m. until 2 p.m. at his shop at 210 Pacific Coast Highway, Hermosa Beach.